I love history, love learning about and understanding the past, embracing the road that brought us to our family and society. I may not always love the history as it happened but think it’s an important part of what makes us. So I really enjoyed a recent outing to Holiday Walk at Meadow Brook Hall on Oakland University’s campus in Rochester. The 88,000-square feet (yes, that big) Tudor home was built between 1926-1929 on a 1,500-acre country estate owned by Alfred and Matilda Dodge Wilson. Matilda was originally married to John Dodge, one of the founders of Dodge Brothers Motor Car Company. They had three children and lived in Detroit. They bought 320 acres to have as a weekend and summer getaway (Matilda and Alfred later purchased the additional property). John Dodge and his brother contracted Spanish Influenza at an auto show in New York in 1920 and died, leaving her as the wealthiest woman in the U.S. at that time. Their youngest child had died a year earlier. About five years later, Matilda met and married Alfred Wilson, who was successful from his lumber business. They eventually adopted a son and daughter. 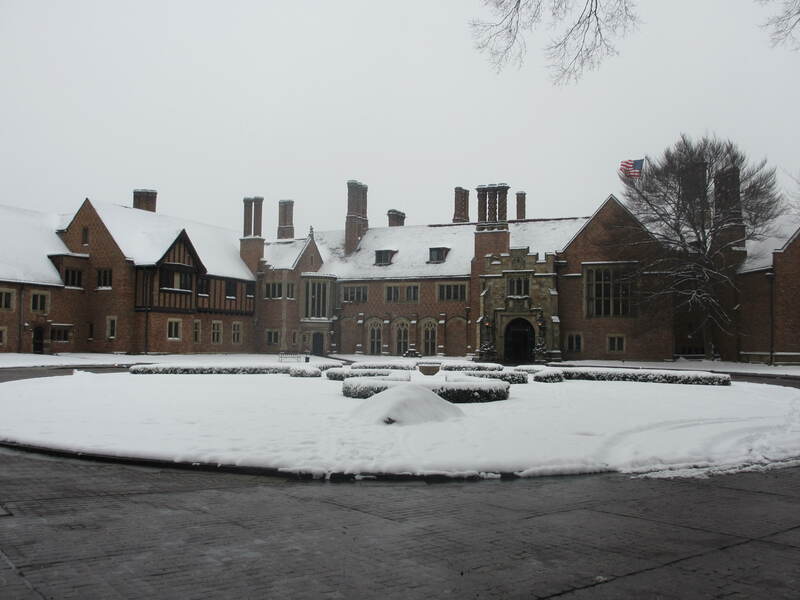 Meadow Brook Hall hosts an annual Holiday Walk event that opens the home for tours through festively decorated rooms. There is a different theme each year so this year was “Treasures of Travel.” This theme put numerous artifacts and treasures, including clothes, toys, furniture and more, on display from the many trips the Dodges, then Wilsons took around the world. What I found so interesting about this home was that most of the rooms were cozy, warm and welcoming. Some older, large homes can be drafty and more showcase than home (of course some modern, large homes are the same!). Perhaps the Christmas trees and decorations in every room provided the ambiance but I think it’s also the architecture and furnishings. The sun porch was so inviting with three walls of floor to ceiling windows overlooking the grounds and furniture carefully arranged for conversation and relaxing. Despite the snow falling outside, I easily imagined sitting in the room with a book and cup of tea. The library was fantastic, as was Mr. Wilson’s bedroom with the horse pictures and semi-rustic (yet high class!) furnishings. Both Frances and Danny had guest rooms for their friends to stay the night (which made sense as the docent pointed out back then cars didn’t travel as fast from Detroit to Rochester). As with most great estate homes from the past, the staircase is grand and awe-inspiring, especially when you get to the top and see a huge ‘lobby’ with enough room to host a small party! In many of the rooms you saw closets or staircases ‘hidden’ behind panel walls that blended perfectly into the room. It made me smile to imagine being a child growing up in the house, sneaking through the house via winding stairways in the wall. How fun! A docent (volunteer) was in each room, sharing great facts and history of the family, their travels and the décor in that particular room. For instance, we learned Matilda’s daughter, Frances, became a well-respected horsewoman/breeder in Lexington, and the oldest son, Danny, was killed on his honeymoon at 21 years old after a dynamite explosion (ironically he survived the explosion but on the way to a hospital via boat, he fell overboard and drown.). We didn’t get to see all 110 rooms of the home (hoping another tour shows you those areas) so I know the home is way larger and grander than I could imagine right now. But overall I was impressed with the craftsmanship, architecture, décor and history. A short walk from the hall were Danny’s Cabin and Knole Cottage, Frances’ playhouse. 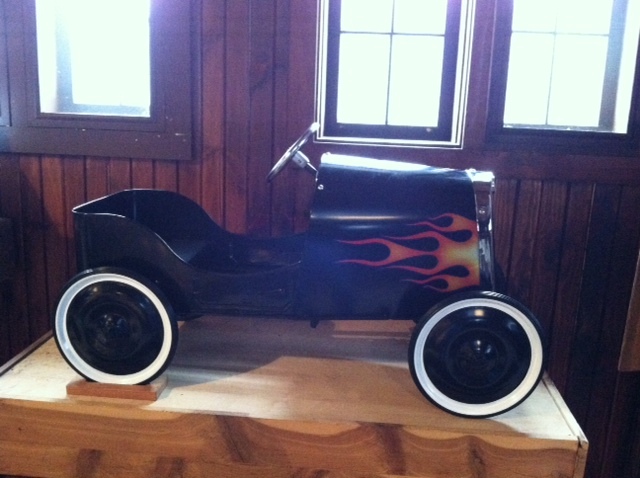 These were both quite the ‘playhouses.’ The original part of the cabin was built in 1926 as a playhouse, then a workshop was added in 1937 for his hobby of working on cars and engines. Frances’ Knole Cottage was built at ¾ scale replica of a real house – back then it was one of the few homes in the area with working plumbing and electrical. It was built to teach her how to manage a household so she even got a checkbook and budget (at 12 years old). We had to bend down to walk through the doorways but I imagine any young child would love it. The Wilsons deeded the home and grounds to Michigan State University in 1957, which eventually became Oakland University. Meadow Brook Hall has been well-preserved and cared for over the years by a dedicated team of staff and volunteers. The Christmas decorations are creative, tasteful and fun. I’m so happy we went to this event. It certainly put me in the holiday spirit and we enjoyed the walk through history. Holiday Walk continues through Dec. 23 so don’t miss this great event.